Improvisational Quilting: Rules to Guide Your Way — Hi! I'm Kat Sturges...Loving the Creative Life! I've been getting into quilting again and fabric is everywhere in the studio! While traditional quilts are surely beautiful, there is something about improvisational quilting that sets my spirit free. The play of chaos with structure, ebbing and flowing throughout a quilt is the excitement I need to keep me driven to see what I can create next. I've decided to share my secrets, I've been quilting for a long time and my methods have been developed over time. It now feels right to share those methods freely in hopes that they might inspire another budding quilter to try his or her hand at improvisation. In improvisational sewing, there are a few things to remember. A little bit of structure can set your quilting free and ensure beautiful designs. There is so much freedom from just sitting down with your bags of scraps and a serger and seeing what you can come up with! And with a little bit of planning your quilt will retain the freeform style with enough order to create a visually stunning piece. With a little bit of guidance you can be free from patterns and begin making quilts that shine with originality and interest. 1. Think about contrast when you begin sewing pieces together. Choose lights, mediums and dark tones if you want to provide definition in the design of your quilt. 2. Too much pattern can make your design get totally lost in translation. I learned this the hard way when I first began quilting. I love patterned fabric of most varieties and tend to work with it a lot. I use color and scale of prints to define the designs in my quilts most of all. 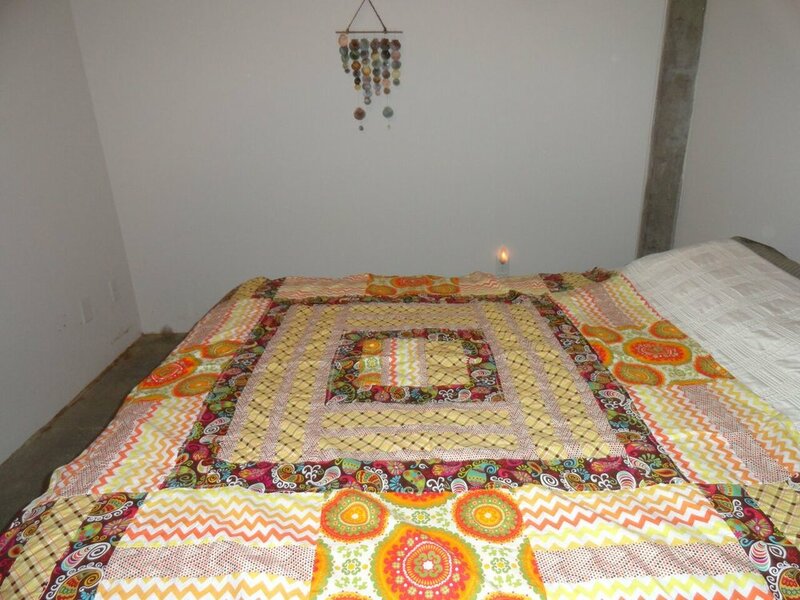 A sure way to create a stunning improvisational quilt however is to work with mostly solids in different colors and work in a few prints here and there. 3. Creating a few lose rules for your design can bring comfort to chaos. Rules can be anything from the style of pieces to color placement or scale. I also love to think of abstract design rules, like placing the smallest elements in the middle and getting larger as you work your way out to the edges. Sometimes I choose to work with mainly angles, or other times with squares and rectangles. Sometimes I create improvisational blocks with borders to frame them. Currently I'm working on a rainbow quilt with rainbow colors alternating with white fabrics. Create a few rules you are comfortable with every time you start a new quilt and the results will be gorgeous! 4. One great way to choose a design to base your quilt on is to choose a quilt block and then make it with large pieces. That's a modern way to design a quilt and you can work in improvisational sections throughout the design. 5. Sketch out some design ideas and think about leading the eye throughout the quilt. Where do you want the focal point to be? Or do you want an overall design? 6. Organize your scraps by color family and when you have free time, go through and square off the pieces so the edges are straight. That way when you sit down to do improv you can just grab from the scraps and get right down to business. 7.. Last but certainly not least, set yourself free and enjoy the process. The reason I make improvisational quilts is because it challenges my mind throughout the entire process. Coming up with designs and solutions is so addictive and every quilt turns out to be a unique expression. Have fun and be bold in your designs! With improv you can always change your design midway through or scrap the quilt and turn it into something else all together. I hope these ideas get your creative juices flowing! There are times when you just want to grab some scraps and sew, and other times when it's fun to have a kind of plan. With improv you just can't go wrong, designing as you go has so much freedom and joy to it.